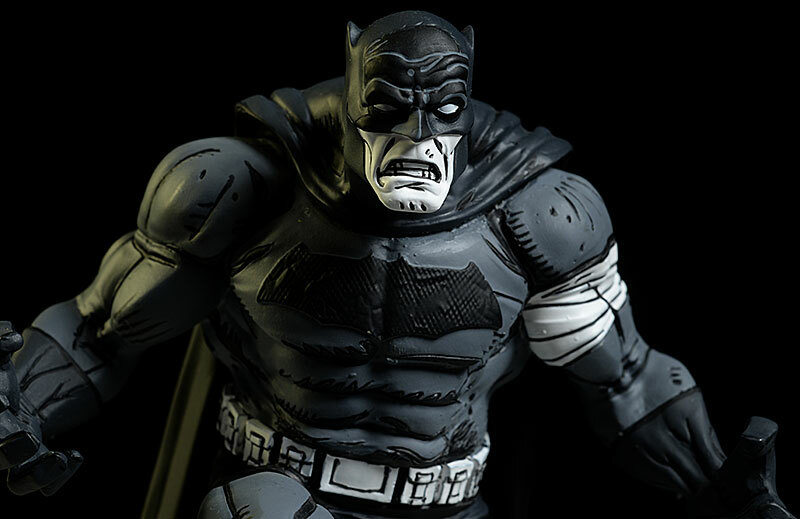 It might not seem possible, but DC Collectibles continues to find great Batman artists for their Batman Black and White series of statues. 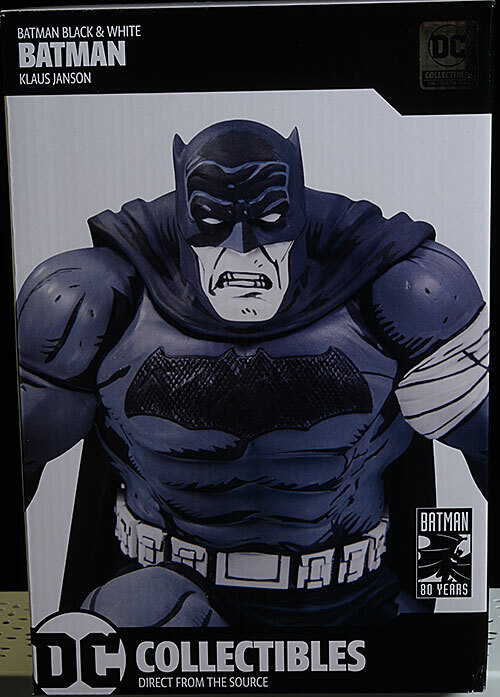 The latest one to ship is based off the work of Klaus Janson. 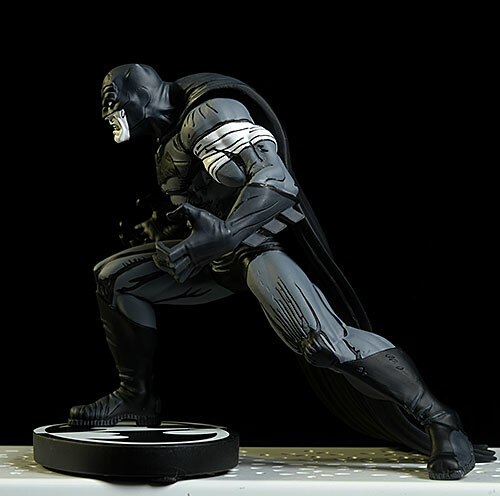 This statue is limited to 5000, and will run you around $70. It's a box, and follows the standard design from the last couple years. There's no numbering on the box itself, but the edition size and number are printed on the bottom of the statue base. The interior foam eggshell trays are sturdy and well made, and the two piece statue is held safely. It's all fairly collector friendly, of course, but there's no Certificate of Authenticity. 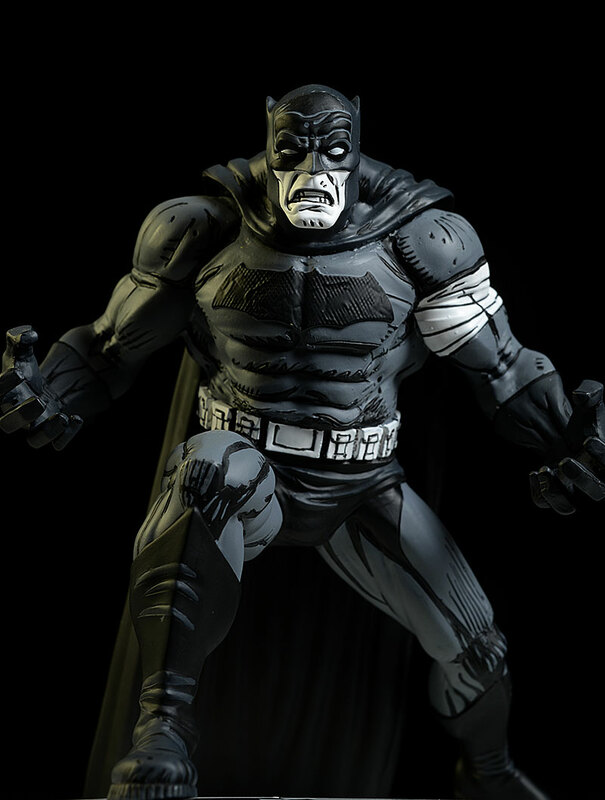 This statue is based right off a specific piece of Janson's art, like the majority of the past designs. And I love it! I've talked before about how I like designs that incorporate and acknowledge the existence of the base, which this one does. He's stepping up onto the base, with his back foot lower, resting on the shelf. He's super dynamic, coming at his opponent with gripping hands and gritted teeth. 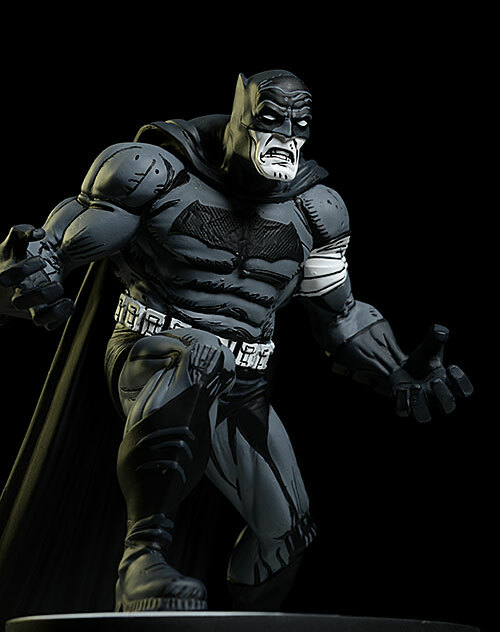 This is a bulky, thick design, similar to the Dark Knight style, and the chunky appearance looks fantastic. 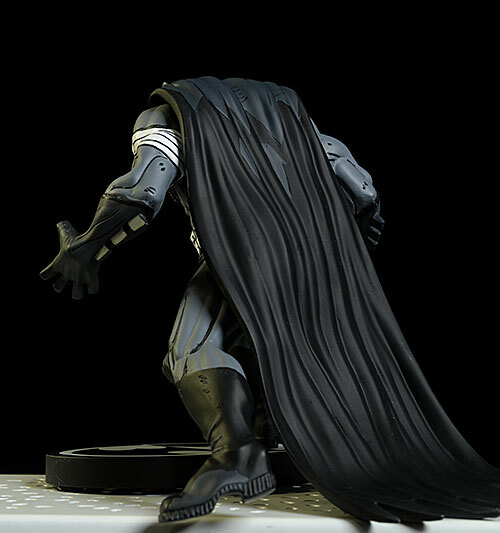 The cape flows down the back and rests behind the base as well. 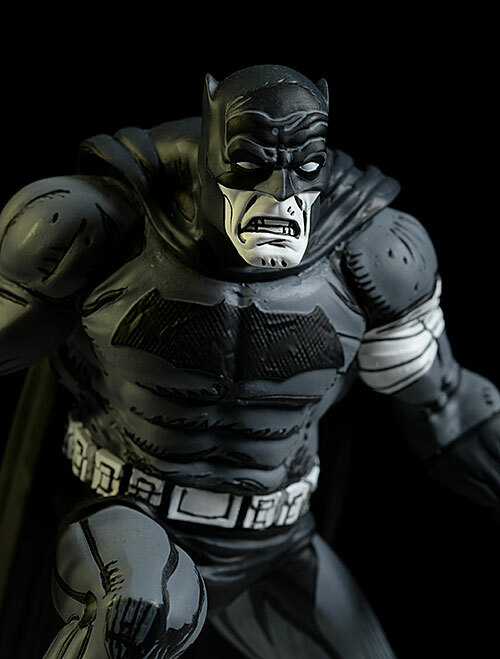 Small details are here, like the textured bat symbol on the chest, or the blocky pockets on the belt. While there's not a ton of surface texture, what's here highlights the paint work nicely. He stands about 6 inches tall in the crouched position, including the base. Let me start by saying I love this paint design - love it. 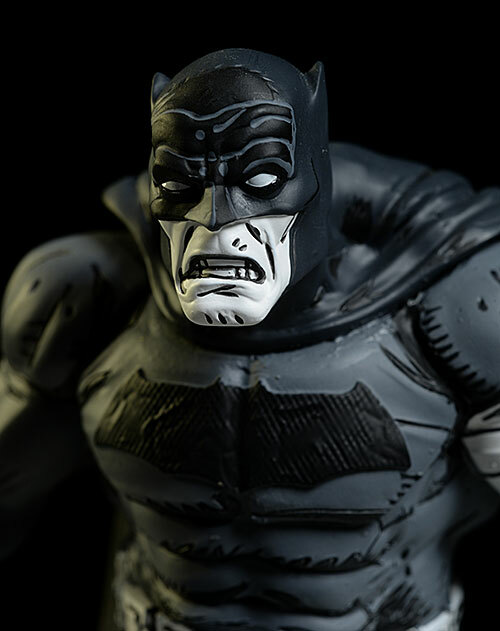 The line art, comic book style jumps off the shelf, and compliments the sculpt and overall art perfectly. It creates an interesting effect, almost two dimensional, and while I don't want every statue done this way (too much of a good thing and all that), I do think this was the perfect choice. And yes, it got the full four stars, but sadly, I do have a couple quality nits. Edges aren't always as sharp as they should be, particularly around the eyes and face. These aren't huge problems by any means (especially at this price point), and weren't significant enough to drop the score, but they are still worth noting. The price point is good - $70 - but it has risen slightly over the past few releases slightly. It's still a solid average value though, and regular readers know my **1/2 here means this particular category won't affect my overall either up or down. The foot peg is metal, the base is polystone. Take the same care you normally would. This is one of the best releases in this line in quite some time, and that's saying a lot. While some of the recent artwork has been very taste specific, the line has continued strong. But this one stands out even from the rest, thanks in very large part to the terrific paint work. - has him for $70. - also has him for $70. - Entertainment Earth has this for $70 as well. 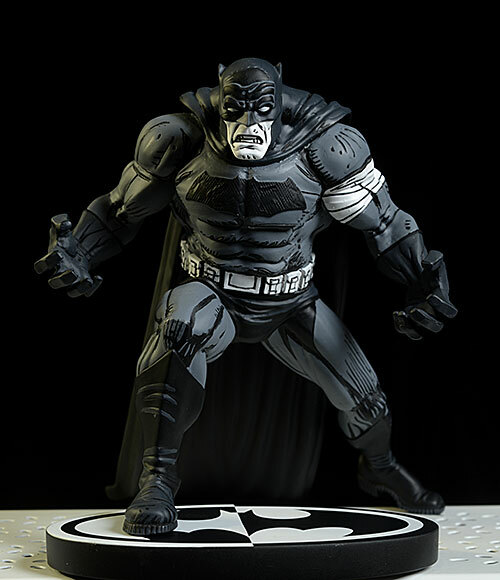 The Jiro Kuwata was the most recent, but I've also looked at pretty much every previous release, including including the recent Gerard Way Joker, the Gerard Way Batman, the Cloonan, the Spy vs Spy release, John Romita Jr's artwork, the Breyfogle, the Jason Fabok version, and the Sprang Joker and Batman. There's lots before that as well - you should also hit the Search Reviews page to find them and in case any other applicable reviews were done after this one was published.